TheFriskyIan wrote: So I just got MGSV about a week ago and only played through the first two missions, and I've never played a Metal Gear game before. Any particular reason why I'm being chased by a man on fire on a flaming horse after he gets run over by a tank and then chased by zombies with super speed? For a stealth game this is pretty over the top. I mean. I'm having fun don't get me wrong, but Jesus this is pretty crazy and almost funny. Two big reasons: A: Hideo. B: Kojima. Welcome to his cosmic roller coaster of WTF. @TheFriskyIan: One of the hallmarks of the MGS series is its contrast between hard military realism and fantastical asskickery. In nearly every game, you'll find, for example, a squad of idiosyncratic super-powered snowflakes (often improbably dressed) who serve as boss fights. You'll also find horror elements -- ghosts, a levitating psychic, an apparent vampire, and (in the latest one) pseudo-zombies. Lastly, you'll see a lot of high tech that just would not work or be practical in real life -- such as most of the titular metal gears. Having grown up with the MGS series I'm always surprised to see people surprised at this contrast -- I've been used to it since I was 13. Last edited by Monk Ed on Sun Nov 08, 2015 10:58 pm, edited 1 time in total. Monk Ed wrote: Lastly, you'll see a lot of high tech that just would not work or be practical in real life -- such as most of the titular metal gears. I believe I saw that when I was being told how to make "High military grade boxes" and I'm like "What's so special about this damn box other than the fact that I can hide in it?" Solid Snake in MGS2 wrote: Treat your cardboard box with care. Take care of the box and it'll take care of you. Don't think of it as just another box. Treat it with love...don't be rough. TehDonutKing wrote: Stop playing right now. Turn it off. Play all the other games in the series first. Playing MGSV without having played the others is akin to watching EoE without having seen the TV series. I gotta second this. Also, best to do things in release order (1, 2, etc) then chronological order can happen when you understand the story better. The 2 original MSX-based games are tricky ('80s games and all that) but included via the menu of MGS3. I'm totally getting Legacy Collection for my brother's Christmas present while mentioning Steam has GZ and TPP. I'm sure he's at least heard of the series, if not possibly played some of MGS1 at some point. I recommend: MGS1, MGS2, MGS3, MGS4, MGS:PW, and MGSV, in that order. Why? Because that's how I played them. That's release order but without PO and the original Metal Gear games. I doubt PO is really necessary (I hear it wasn't made by Kojima), and I feel like MG1 and MG2 aren't worth playing for a newcomer because they were made in a very different era with a very different mindset and just don't have the same sense of production values and storytelling that began in MGS1. the Philosophers, Cipher, and the Patriots, and foreshadows MGS4, even giving away the plot twist of who founded the Patriots. It also gives a better explanation of Snake's motives in Peace Walker. That said, you can skip it, and not much is brought up. Snake's Revenge and Ghost Babel non-canon, the Ac!d games are more or less something else entirely with superficial similarities in characters, Portable Ops is a canon spin-off, and Rising is an attempt at starting a shared universe. These are more or less skippable, with Portable Ops just explaining a few details, and Rising providing a continuation of a side-character's arc. The main games cover the story of the Snakes, and that's about it. Okay, random ponderings that I was trying to tell to Monk, but my room's Internet is going to be on the fritz for...probably three more days, because my mandated Internet provider is a piece of crap business that likes to sit on it's hands and take money instead of actually doing their job. This is mostly in the vein of fanfic justification for differing storylines, but it has occurred to me that a case could be made for Ground Zeroes and the Phantom Pain being alternate timelines, if not outright alternate universes. It's a small reason (and it exists for a legitimate, real-world reason), but it amused me to think about. ...Arms Material, Geist, Samozaryadnaya Vintovka Tokareva...all of that. And these are weapons in completely different series: no ARs, no AKs, nothing. Now, the reason this happened in real life is, of course, money: considering the rumors I heard about the financial strain of developing these games, it's doubtful Konami would have shelled out the cash necessary to secure the licenses from each of these companies to use their products in-game (which they have to: artistic usage and renditions of real-world weapons is a very tidy income for these companies, which are already making a killing in firearms and firearms accessories sales). Honestly, I like it: it adds to the feel of the world for me, seeing these original weapons and the companies that produce them. ...or this is a completely different world from the mainline MGS series. Which could then be used to argue over all the other inconsistencies and bad retcons that this game attempted to make to the other games in the series (not saying the game is bad: next to MGS3, this might be my hands-down favorite MGS game, at least in terms of gameplay. It does attempt to do a lot of canon-welding, however, and doesn't always succeed). Anyway, that's my headcanon, at least. Monk Ed wrote: I recommend: MGS1, MGS2, MGS3, MGS4, MGS:PW, and MGSV, in that order. That's pretty much release order anyway, so yep, seconded. The MSX Metal Gear 1 and Metal Gear 2: Solid Snake games need some love too, seeing as MG2: SS is like a prototype of MGS1 much in the way Peace Walker's a prototype of Phantom Pain. They're all excellent games in their own right, though! And yeah, Portable Ops is IMO completely skippable without missing anything (not a Hideo Kojima game, so it's not in Legacy Collection) since any backstory needed is explained in each game's timeline credits. Last edited by Sailor Star Dust on Mon Nov 09, 2015 3:43 pm, edited 1 time in total. In MGSV this is largely a non-issue. Most of the potentially featured weapons would be covered by government designations (for instance Colt can't charge royalties for the 'M4' name because the courts ruled they don't own it) and the patent rights for the designs expired decades ago. Kojima likely could have given us a game full of 1911s, M16s, etc. and not paid a dime extra, especially given that none of the weapon brands are mentioned outside of inventory screens. I suspect the fictionalization was more for convenience - enabling the Legendary Gunsmith's fantasy kitbashes and so forth. Actually, they can and do: they aren't charging for the use of the name, but for the rendering and presentation of an object that is their weapon. It's not a patent, it's a royalty. Vaughn, in this quote, is Ralph Vaughn. He works at Barrett (makers of the Barrett sniper rifle), and his job is to negotiate the rights to Barrett firearms as used in video games. (taken from this article: [url]http://www.eurogamer.net/articles/2013-02-01-shooters-how-video-games-fund-arms-manufacturers[/url]). That's getting into a whole other issue, away from what I wanted to discuss (possibility of alternate timelines, universe, whatever). They're not made by real world companies. They're made by Diamond Dogs. Why would they name them after real world products? I wonder why they were too bothered about the Russian gear though, MGS V has a kitbashed Mil Mi-24 Hind and Mil Mi-28 Havoc in the role of the Soviet gunships for example, unless the Russian's have wised up to video games too. Suppose it's just easier not taking a risk. TehDonutKing: No, the Diamond Dogs acquire the plans to make their own versions of pre-existing weapons...unless the Diamond Dogs are manufacturing all the weapons in the world under dozens of shell companies, in which case, the GMP I'm getting is way too low. Kaz is holding out on me. Look, here: all the weapons are analogues for real world weapons, but the companies are as well. Both East and West bloc weapons. It's the top slide of a 1911, the basic outline of a Browning Hi-Power, and the trigger mechanism (and some of the smaller pieces) of a CZ75. Every weapon in the game is kitbased. Actually even in Peace Walker they were doing this with the AK-47, but the changes weren't radically different like they are in MGSV. It was called the "RK47" assault rifle, but it looked the same. I wonder what happened, maybe they ran out of money or couldn't get in touch with the Kalashnikov family to get the license before the game was released? By this logic, Gob, does NGE spiral off into an alternate universe as soon as the name on Misato's beer cans changes? When he first brought this up to me I thought he was going to suggest it was an AU because of the change in (American) voice actor for Snake, because that's a much more striking difference to me. As much as i love Kiefer in TPP, Ground Zeroes should have been Hayter's last hurrah, since a few months in good health is far less likely to change your voice than 9 years in a coma and possible damage to the vocal cords. In all seriousness, though, a change in beer brand would be a lot less significant than the changes in weaponry and vehicles used by major bloc forces: I mean, it's more than the alt-history usage of combat walkers. T72s have become TT77 NOSOROGs, the Mil Mi-24 is replaced with the HP048 Krokodil, the M84A MAGLOADER replaces the M1A1 Abrams...it's across the board, and though they LOOk similar to their real-world analogues (all of which were already used in previous games), the actual visual differences are significant enough to mark them as completely different devices, as if the name and manufacturers weren't enough. I mean, it's a silly detail, but for a series that had a severe eye for detail in it's real-world military devices, it's very noticeable. IronEvangelion: The changes in Peace Walker were actually extremely minor: mostly, they were relegated to issues of anachronistic placement (common for the series, actually), but the RK-47 is the only name change in the game. This, actually, was probably not deliberate: there is an ACTUAL RK-47, which is an airsoft weapon, but it looks very similar to what was used in Peace Walker. 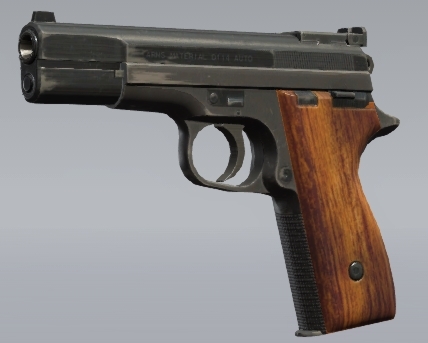 So, most likely, they utilized an RK-47 (which would have been easier to get and model in Japan, due to it's gun bans), and used the name of that weapon as either a tacit acknowledgement of the source model, or an outright mistake (which is possible). Gob Hobblin wrote: I mean, it's a silly detail, but for a series that had a severe eye for detail in it's real-world military devices, it's very noticeable. To you, and others with such an eye for it. I literally did not notice it whatsoever until you brought it up. I noticed right away. As soon as I started messing around in Afghanistan I was like, "What the hell are all these hideous bastardized AKs? Did the Soviets do a re-armament during the Afghanistan invasion that I previously didn't know about?" For me it was a huge letdown, but I guess when you have a game with this many friggin' weapons you have to cut costs somewhere.